ROME — Roma club icon Francesco Totti will retire at the end of the season when the 40-year-old’s contract expires, new sports director Monchi said on Wednesday. "I want him here right by my side. He is Roma. He can teach me what Roma is," said Monchi at his unveiling in the role, adding the captain will remain at the club in a management position. "There is an agreement in place. This is his last season but then he continues in management." "I want Totti to explain to me what Roma is, to make me understand what he knows," added the Spaniard Monchi, who won credit for his sports director role at Sevilla, who won the Europa League in 2014, 2015 and 2016. The striker Totti has played all his professional career at Roma and is a hugely popular figure, making his debut in 1993. Roma coach Luciano Spalletti had a series of run-ins with the Roma No 10 last season. Despite that and his advancing years Totti answered with a string of key goals and eventually got another 12-month contract last summer, although Roma said then it would be his final season. Asked how he felt after his last derby, the weekend defeat to Lazio, Totti said: "Others see this is as my last derby, but I don’t." The former World Cup winner has yet to make any official announcement, although a club spokesperson told AFP there was "nothing new or different in what Monchi said". While the Spaniard may have hastened Totti’s departure, Roma had already announced there would be a six-year contract as a club director ready to be signed once he ends his playing career. It appears overwhelmingly that Totti could make his farewell bow when Roma host Genoa in their last game of the season on May 28, one final chance for the one-club veteran to bid goodbye to the Stadio Olimpico faithful. 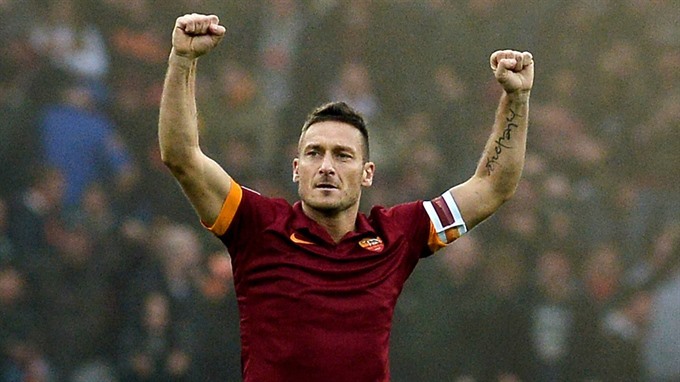 The Roma talisman’s 616 Serie A appearances are third most all-time, while Totti’s 250 goals in Italy’s top flight are second only to Silvio Piola’s record of 274.